Dice hospital is a game about managing hospitals and patients. Each player controls a different hospital, taking ill patients from a central pool of ambulance arrivals. 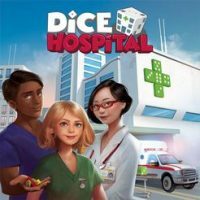 The patients — represented by dice — will need to be healed using various hospital effects, through a series of higher values, until they can be discharged. Add a Review for "Dice Hospital"
Dice - these are your patients!